As is the way in many European cultures, the French love to celebrate special occasions with food. And not just any old food, often dishes are created just to celebrate a particular event, at times becoming just as iconic that the event they were created for. One such dish is the Paris-Brest. This delicious choux pastry was created at the turn of the 20th century to celebrate the annual bike race from Paris to Brest, and is shaped like a doughnut to resemble a bike tyre. The pastry is sliced through the middle and filled with a light and creamy hazelnut praline. Back then, the cyclists competing in the race would snack on these sweet treats (a far cry form the carb gels that pro cyclists have nowadays), but now they are available in most patisseries in France. In a deep sauce pan bring the milk, water, sugar, salt and butter to the boil. Once the butter has melted, take the sauce pan off the heat and ad the sifted flour. Return the pot to the heat and dry the choux pastry for 2-3 minutes. Transfer the choux pastry to a mixing bowl and add the eggs one a time, make to incorporate each egg before adding another one, you can use an electric mixer like a Kitchen Aid with the paddle attachment to make it easier. Using a piping bag, pipe the choux pastry in a ring shape, brush the top with egg wash and sprinkle with coarsely chopped almond. Bake in hot oven for 40 minutes. Toast the hazelnuts in the oven. Make a dry caramel with the sugar, make it the same way you would for a normal caramel but without water. Pour the caramel over the toasted hazelnut and leave to cool. Blitz the hazelnut in a food processor until you have a smooth paste. Whisk the egg yolks and sugar together until slightly white. Then add the corn flour and whisk until mixed through. Bring the milk and vanilla pod, seeds scrapped out, to the boil. Pour the hot milk over the eggs and whisk until dissolved. Cook over medium heat until it start to boil, then cook for a further 1 minutes. Transfer the crème into a clean bowl, cover with glad wrap and leave to cool in the fridge. Make sure the glad wrap touches the crème! Whisk the crème patissière until smooth, then add the hazelnut paste, hazelnut praline, salt flake and whish until combine. Add the soft butter little bit a the time and whisk for 3-4 minute until homogenized. Cut the choux pastry in half, so you have two rings. Using a piping bag with the star nozzle, pipe the crème mousseline on the bottom half. Put the top part of the ring back on and sprinkle with icing sugar! Enjoy straight away for dessert or afternoon tea! My love of cooking has a lot to do with nostalgia. I feel that when making a recipe from my childhood or one that is linked to a place or a special event, I am immediately transported back to that time or that place and can relive those delicious memories once more. Gâteau Basque is one such recipe for me as it represents the time that I spent working in the Basque country early on in my cooking career. The recipe itself is not fancy or particularly difficult. It’s a classic sweet pastry, filled with a vanilla and rum cream, not unlike the crème patissière that you’d find in a strawberry tart. In the Basque country this cake is enjoyed as a dessert after dinner, but in fact it would make a perfect afternoon teacake with a delicious cup of coffee or fragrant earl grey on the side. 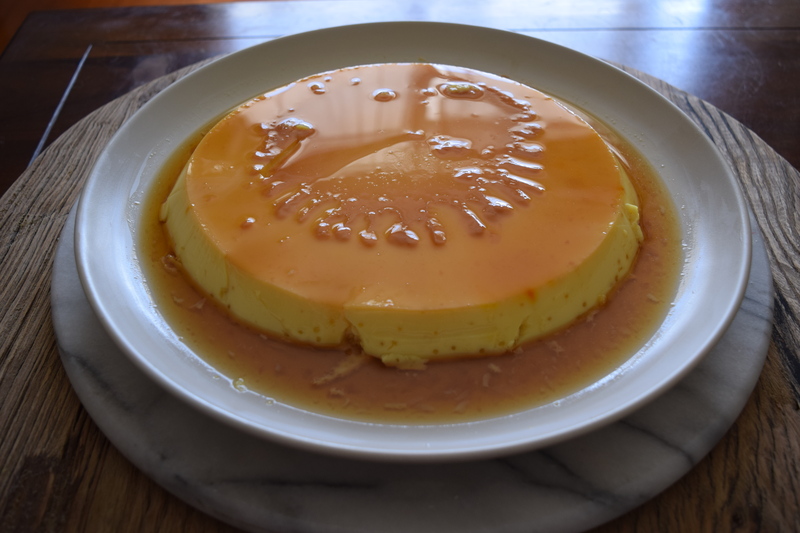 What recipes are nostalgic to you? Combine the soft butter and sugar in a bowl. Add the flower, baking powder, eggs, salt and rum and mix until combined. Transfer the dough onto a lightly floured bench and slightly knead the pastry until you have a smooth dough. But do not over work it! Slightly flatten the pastry, to make it easier for yourself when you roll it, wrap it in cling film and place in the fridge for about 1 hour to rest. Bring the milk and vanilla skin to the boil. Whisk the eggs and sugar together in a bowl until the sugar is dissolved. Pour ¾ of the hot milk over the eggs mix and whisk until dissolved. Pour the mix back into the saucepan and cook on medium heat while whisking for about 4 minutes. The cream needs to be cooked well so it thickens when it cools down. Butter a 22cm baking dish (medium depth) with soft butter. Roll the pastry on a floured bench to a 4-5 mm thickness. Take 2/3 of the pastry to line the base of the dish, make sure the sides are clean. Once the cream has completely cooled down, transfer it the baking dish. Use the rest of the pastry to do the lid that goes on top of the dish. Tuck the sides in well. Using a fork, gently score the top of the pastry. Brush the top with a slightly beaten egg and bake in hot oven for about 40 minutes depending on the oven you have. The top should be golden brown and if you pierce it with knife, it should come out clean. Leave the Gâteau to cool down completely before serving, or keep it for the next day of you can resist – it will be even better!